One of the problems of constructing genealogical charts is the proliferation of spreading branches as one progresses into the older generations. In other words, building up a family tree from the bottom up -- often the only way for those without the pedigree that their ancestors constantly wore -- is that each earlier generation will have roughly twice the number of noteworthy characters. For example, one might have only two parents, but one is also likely to have four grandparents, eight great grandparents, and... by this logic... two to the power of the number of generations one is investigating. Obviously, however, two to the power of oh say... 150... is not a number that exists (because of its immense size). It's also a bear for anyone trying to chart the process on a single piece of paper. (Trust me on this one!) In either case, clearly there is something wrong here. The population of the royal folk simply don't amount to 2 to most any higher power. Simultaneously there is also the problem of spreading roots as one progresses into the younger generations -- same inescapable numbers, albeit in this case, the number of children in any given generation can range from one (else there would be NO descendants) to as many as 18 (yes, there is a specific example coming up) to many, many more (in the case of kings with progeny in the hundreds). Still, even here the numbers can be daunting. Unless, of course, there are intramarriages rampant among the ancestors... such that instead of having eight great grandparents, one only has five, because several of them married each other. And in fact, the good news for the royalty crowd is that their intense program of intramarriage among sisters, brothers, half-siblings, nieces, grandchildren, uncles and aunts, pets, and so forth... keeps the ancestral crowd at the top enormously more manageable (and chartable upon tables... such as Figure 1 below... particularly the line from Kalimath and Seth -- Men are in bold, women in bold italic). That's one problem solved. Still, with royal succession being so important, we often encounter the second problem of genealogical construction: that of having to occasionally follow more than one line of descent. There is, in effect, more than one way to begat a future generation of kings and queens. The first example of this is the need to trace the different lines of Cain and his half-brother, Seth. There are undoubtedly a host of other lines of descent as well... all happily begatting along in rough parallel... but these we will have to forego to some degree (if only for a lack of direct evidence of assumed inheritances). In the end, however, as is alluded to in the Figure 2. 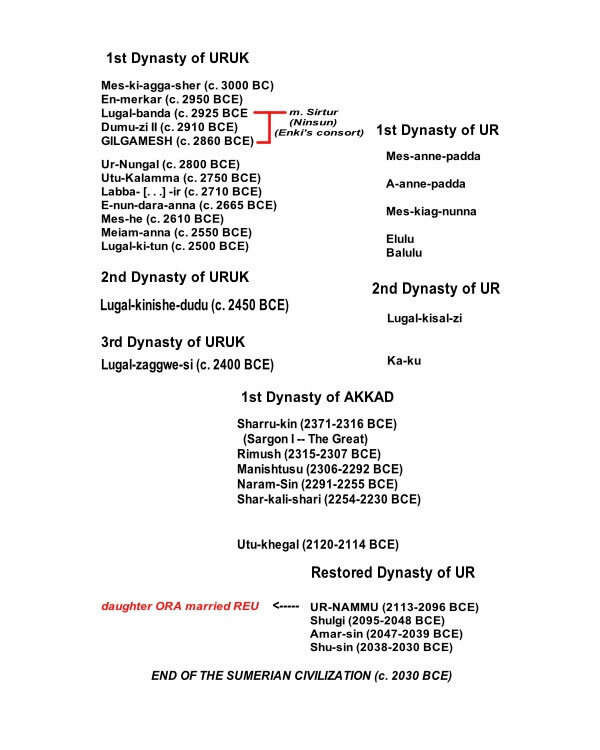 Sumerians King List (following the notes on Etana), the various kingdoms of Sumerian (and pre-Babylonian) do maintain royal lines, and importantly are destined to contribute genetically to the Cain and Seth ultimate lines, the ones leading inevitably to King David. Note, for example, Lamech’s designation as “King of Ur”. According to Laurence Gardner, Genesis of the Grail Kings, "Enoch, son of Cain, after whom Cain named the first city he founded, is not the same as Enoch, son of Jared (Genesis 5:18). 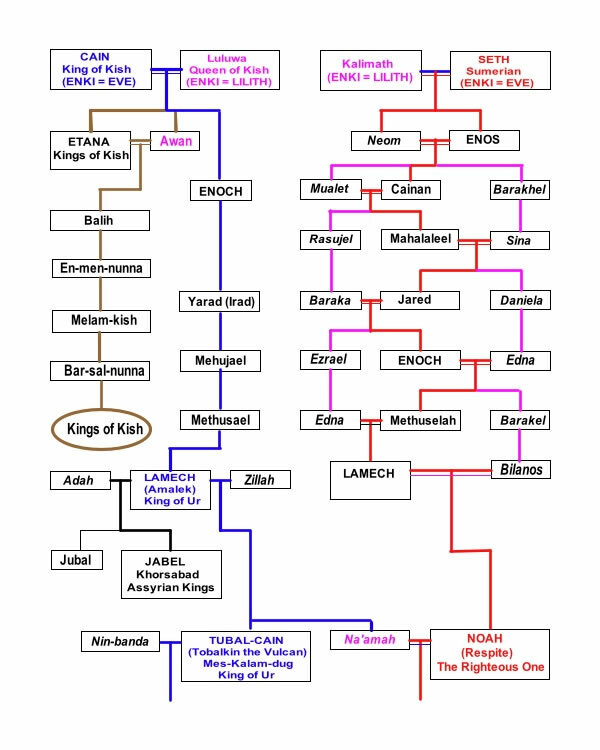 The second Enoch in the Book of Jasher was a descendant of the first, and descended from Seth as well as from Cain. (Jasher 2:37) This later Enoch was the father of Methuselah, and was reputed to be so wise that a hundred and thirty kings and princes 'required of Enoch that he reign over them, to which he consented.' (Jasher 3:9) The Harvard Book of Jasher relates that the year Adam died, Enoch decided to live apart from other people. He appeared once a week, then once a month, then once a year, teaching his subjects about the ways of God. When it came time for his ascension into Heaven, he did not die. "Instead, a horse descended from Heaven, paced in the air, and for seven days Enoch rode the horse. On the seventh day, Enoch and the horse were taken up into heaven in a whirlwind, with other horses and chariots of fire. (Jasher 3:17-36) Enoch inherited the garments of skin that God had made for Adam and Eve when they were banished from Eden. Before he was taken up to heaven, he gave the skin garments to his son, Methuselah, who in turn gave them to Methuselah's grandson, Noah, so that they would be kept safe from the flood. (Jasher 7:25)." The apparently dual nature of Enoch, appearing in both the Cain and Seth lines (as just mentioned by Gardner) points also to the fact that many of the Cain line descendants have equivalent names to the Seth line (see Figure 1). Because of this, many scholars (including those from Hebrew University... who might have something of a vested interest in the subject) have begun to suspect that the Seth line as given in the Bible is quite possibly fictitious... or at least partially. This fictional nature includes assigning to Noah the bit about the Great Flood... which by our reckoning occurred before the time of Adam. The implication is that the story of the Flood was added to the story of Noah, with Noah playing the part of the Sumerian Ziasudra. Inasmuch as there is such an enormous amount of intramarriages of brothers, sisters, and so forth, the Enoch and Enos lines of descent may be even more conjoined than generally assumed. In fact, the reason for a separate Seth line may simply be an attempt by the authors to insert some distance from their hero, Seth, and a Cain who had raised cain by murdering his brother Abel. Stranger things have indeed happened when it comes to pleasing or attempting to please a very angry, dysfunctional god. Etana is not part of the particular line of descent we will be following in these annals. However, he may very well be a direct ancient ancestor via the Kings of Kish and the other City-States of Sumer (Ur, Uruk, Akkad, et al). It is important to note that the earliest Kingships moved from city to city, alluded to already in the listing of the Antediluvian Kings of Sumer (Figure 1 of The Adam's Family). And while, the transfer of kingship from one City-State to another was likely accompanied by various forms of warfare, conquest, and so forth, the fact remains that the consolidation of new power in any particular city was almost always accompanied by inter-City marriages in order to legitimize the new king. Furthermore, and very importantly, in this particular line of descendants, even if they failed to provide us the records that recorded just who begat who, we can assume that the descendants of Cain included those shown in Figure 2. Accordingly, we will be returning to this particular branch of the family, when we discuss the reconnection of the Etana line of descent with that of the Seth line (the sixth generation following Noah). (Note: the 1st Dynasty of Uruk followed the 1st Dynasty of Kish, which included in order: Etana, Balih, En-men-nunna, Melam-kish, and Bar-sal-nunna. We will return to this Figure 2 in roughly the 21st generation (Seth line). For the moment, we will concentrate upon only the titular head of the Sumerian Kings: Etana (Atun). According to Laurence Gardner, Genesis of the Grail Kings (pages 132-133), "Cain's wife was Luluwa-Lilith, the daughter of Lilith of the Netherworld, heiress to the matriarchal Malku (the Kingship of the Kingdom) [and the origin of the Malkuth (Kingdom) found in the Qabalistic Tree of Life]. She was of pure-bred Anunnaki stock and their sons [Cain and Luluwa's]... were Atun and Henokh. As a result, their Anunnaki blood was further heightened. Atun succeeded his father as king in Kish (c. 3,500 BCE). He is detailed in the Sumerian annals as King Etana, the shepherd who descended to Heaven and partook of the 'Plant of Birth' in order to father his own son and heir King Balih. The other son, Henokh, is better known to us from the Bible as Enoch. "The Plant of Birth was synonymous with the Tree of Life... which was directly associated with longevity and the office of kingship. It was also related to Star Fire and pineal-gland activity. Thus partaking of the Plant of Birth was the equivalent to taking the extract of Star Fire." "This was the potent Star Fire of Heaven, the pure Anunnaki female essence, the 'nectar of supreme excellence' called the Gra-al (later the Graal or Grail). In this regard, the goddess was held to be the 'cup-bearer', the transmitter of the power of the Anunnaki. She was also called the 'Rose of Sharon' (from sha, meaning 'orbit' and from On relating to the Light -- or in Egypt to the Heliopolis temple-city of Annu and Ra, called the 'House of the Sun' (hence, Sha-Ra-On)." "The flower (flow-er) was identified as a lily and these two descriptions come together in the Bible's highly esoteric Song of Solomon, wherein the Messianic bride states, 'I am the Rose of Sharon and the lily of the valleys.'" It should also become clear that the highly esoteric Jewish Qabala (Kabbalah) and all of its derivatives derived themselves from the earliest Sumerian teachings and royal families. The fact that the 'lowest' earth-bound state of the Malkuth appears to be appropriate for the King of Sumerian Kings... hints at the far greater levels in the Tree of Life. We've only just begun, baby! Mehujael was a descendant of Cain, the son of Irad and the father of Methusael (Genesis 4:18). Methusael was a descendant of Cain, the son of Mehujael and father of Lamech (Genesis 4:18). The “other” Lamech is allegedly an eighth generation descendant of Seth (Genesis 5:25), the latter also the son of Methuselah, grandson of a second “Enoch”, and was, in this “Seth assumption”, the father of Noah (Genesis 5:29). "Then Lamech took for himself two wives: the name of one was Adah, and the name of the second was Zillah. And Adah bore Jabal. He was the father of those who dwell in tents and have livestock. His brother’s name was Jubal. He was the father of all those who play the harp and flute. And as for Zillah, she also bore Tubal-Cain, an instructor of every craftsman in bronze and iron. And the sister of Tubal-Cain was Naamah." God's servant took two wives, light and darkness. The light brought forth the shepherd, who was the father of tent-dwellers, and herdsmen, and his brother was the musician, who was the father of harpists and pipers. But the darkness brought forth the blacksmith, the forger of brass, and of iron, and his sister was pleasure. (Wikipedia:) When fully translated, the text has a strong resemblance simply to a basic mythology concerning the origin of the various forms of civilization, the shepherds and musicians being products of the day, and pleasure being a product of the night. [Obviously, these people have not played Ravel's Bolero at night.] Blacksmiths, in carrying out their trade, are also associated with the darkness. Thus, in a sense, Lamech could be interpreted as a culture hero. Some of the names also appear to demonstrate punning - Jabal, Jubal, and Tubal rhyme, and appear to be derived from the same root - JBL (YVL in modern Hebrew): to bring forth, (also) to carry. A similar description existed amongst Phoenicians. The names in the Midrash are also interpreted as an attack on polygamy. Adah is thus the deposed one, implying that Lamech spurned her in favor of Zillah, whose own name is understood to mean she shaded herself. The Midrash consequently regards Adah as having been treated as a slave, tyrannized by her husband, and who was at the beck and call of his mistress, Zillah. It further goes on to claim that part of the immorality, which had led God to [pre- ?] flood the earth, was the polygamy practiced by Lamech and his generation. The last part of the tale of Lamech (Genesis 4:23-24), takes the form of a brief poem, which refers back to the curse of Cain. In the poem, Lamech's stance resembles that of a supreme warrior, able to avenge himself absolutely. However, no explanation of who Lamech supposedly killed is ever given. Some scholars have proposed that it is connected to the invention, contextually by Tubal-Cain, of the sword, for which reason the poem is often referred to as the Song of the Sword. The poem may originate from the mysterious Book of the Wars of the Lord, though the greater context for it is likely to remain obscure.